Leader Materials To achieve the best knot strength in leaders, use the same brand for all sections. Identical materials make stronger knots. Lubricate Your Knots Always lubricate your knots before tightening them. Saliva works on monofilament, but lip balm or a commercial knot lubricant is better for tying knots in fluorocarbon. Match Tippets to Flies To determine an appropriate tippet size for trout flies, divide the hook size by 3. The result equals the typical “X” rating of the appropriate tippet. Example: a hook size of 12, divided by 3, equals a 4X tippet. Tippet Sizes The “X” designation of tippet size comes from a very old designation of wire size for watch parts, later applied to cat gut leaders (one size change equaled 0.001 inches in diameter). Lefty Kreh’s general advice on what the numbers mean is helpful: subtract the “X” number from 9 to get an approximate line test rating. E.g. 6X tippet has a breaking strength of about 2 pounds. Check Your Bait Especially when casting often or in strong winds, examine your tippet and fly every four or five casts. Wind-knots (overhand knots) weaken your tippet by at least 50 percent, and tippets can get tangled in your fly or even knotted around the hook bend — things you won’t notice on a fly that is 40 feet away. Also check the action of the fly on the surface or in the water next to you; trout flies that don’t float well or straight and saltwater flies that “foul” (have materials wrapped around the hook bend) often stop fish from eating a well-chosen fly. Keep Fish-Ready When finished fishing, hook your fly in one of snake guides and wrap the leader around your reel’s spool. This will keep the end of fly line out of the rod top and ready to be stripped out when you’re ready to fish again. Use a Leader When Testing Rods and Lines When testing a fly line or rod, be sure to have an appropriate leader attached; most fly lines are designed to be cast with a nine-foot leader attached. Preventing Corrosion To prevent corrosion, be sure your rods and reels are dry before putting them back in their cases or sleeves. Rinse saltwater rods after every use. 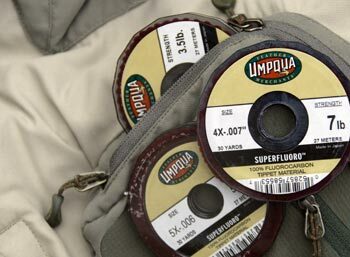 Regular Pledge® furniture polish makes a great temporary cleaner and protectant for fly rods. 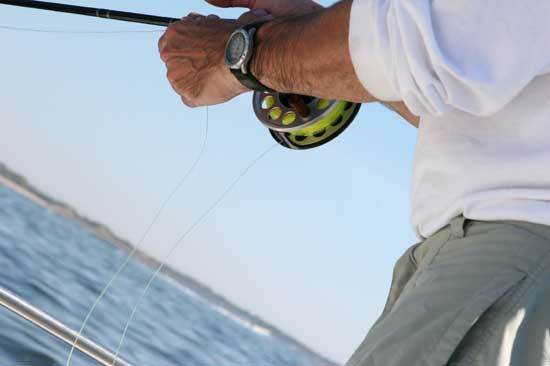 How Fly Rods Break The things that most often cause fly-rod breakage: high-sticking a fish (lifting the rod vertically so that most of the bend is in the tip), car doors, ceiling fans. Overlining Rods You can make a rod’s action “slower” by overlining the rod with a fly line rated one size higher. Overlining rods often helps beginners get a better feel for when a rod loads and can also help experienced anglers throw oversized flies. 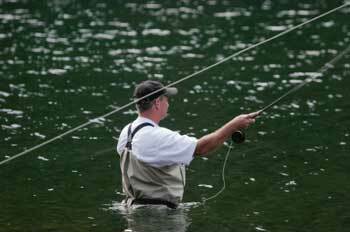 Stringing Fly Rods Don’t try to string your fly rod by putting the end of your leader through the rod guides. 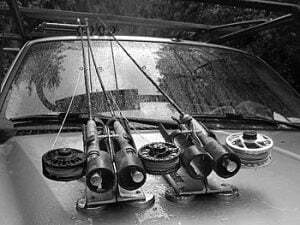 Rather, double your fly line and use the doubled end. It’s much easier and the line won’t slide back through the guides if it slips out of your hands. Dirty Cork Grips You can easily clean and brighten the cork grips of fly rods with dampened fine-textured, soaped steel wool pads. Mr. Clean Magic Eraser™ also works very well and with less mess. Fly Rod Modulus “Modulus” refers to the resistance to bending in a fly rod’s materials. But there is no one-size-fits-all rod modulus. “Fast,” or high-modulus, rods are often favored in saltwater fishing because they enable the angler to deliver the fly more quickly. 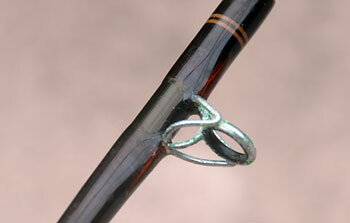 However, slower rods often help anglers make more delicate presentations. To complicate matters further, rod manufacturers often build rods with “faster” butts and “slower” tips. Always test-cast a rod before deciding whether it suites your casting style and fishing techniques. Stuck Ferrules Rod sections stuck together? Use one of these two methods to get them unstuck. If you are alone, place the rod behind your knees and grasp the rod sections on either side; slowly separate your knees to add additional force as you pull the sections apart. With a partner, stand facing one another, grab the opposite sections of the rod and pull apart. If neither of those techniques work, sometimes soaking the stuck ferrule in ice water or a cold stream for several minutes will do the trick. Flying with Fly Rods While most airlines require you to check gear that might be considered dangerous, including any fluids in containers over 3 oz., the U.S. Transportation Security Administration says on its Web site that “Expensive reels or fragile tackle such as fly’s [sic] should be packed in your carry-on baggage.” Most 3-piece and almost all 4-piece rods can be safely carried on, but always check with your individual airline. Rules change. Protecting Fly Reel Drag Systems Always back off the drag on reels after fishing, especially those that use compressible materials like cork. 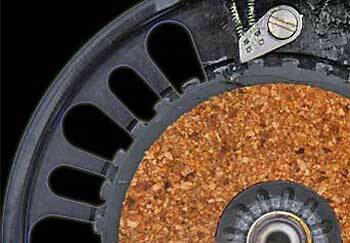 Cork drags perform best when lubricated on an annual or semi-annual basis. Always use the manufacturer’s suggested lubricant. Buying a Fly Reel When buying a fly reel, consider four main features: its weight, its drag system, the diameter of its spool, and its materials and finish. In general, you want as light a reel as you can buy with the proper drag system. Big, beefy drags often add considerable weight to a fly reel but provide low start-up inertia and consistent pressure at higher drag settings. The diameter — often referred to as the “arbor” — and width of the fly reel spool determine how much line and backing the reel holds and how quickly line can be retrieved. Fly Line Care Most modern fly lines contain lubricant additives in their coatings and need only occasional cleaning using hand soap and water on a cloth to maintain their casting and floating characteristics. On the water, wiping with a damp cloth is helpful. Commercially available lubricants will also add distance to your casts and can be applied to a wet line, although they work better if they are applied before your line gets wet. Fly Line Memory All fly lines have “memory” — most often seen in the form of coils when line is first stripped from a reel, especially in stiffer lines made for warmer weather and distance casting. Taking the time to stretch your line in your hands after pulling it off of the reel will improve your casting distance and make it less likely that the loops of your fly line will tangle in the water or the bottom of the boat. Fly Line Twist Many casters unknowingly put twist in their fly lines because their backcasts are canted to one side, making a fly rod tip travel in a circle as they complete their forward cast. Bulky flies can also spin and add twist. There are two effective ways to remove fly line twist. One is simply to spin the fly line between thumb and forefinger in the opposite direction of the twist. The other is to false-cast a number of times while consciously reversing the direction of the circle made by the rod tip (e.g. overhead backcast and sidearm forward cast). Watch Those Chemicals Keep sunscreen and bug repellent away from fly lines and flies. Most products will break down the PVC coating of fly lines, and most fish are very sensitive to smell. Warm Weather Fly Lines When fishing in hot, tropical conditions use stiff fly lines with hard coatings designed for the heat, they will work much better than comparable freshwater lines. But don’t expect these lines to perform well in cold weather, where softer coatings make a line more castable. Sinking Fly Lines Sinking and sink-tip fly lines enable you to reach fish in fast and/or deep water where floating lines would keep your flies too high in the water column. The key number to be aware of is their sink rate, which typically ranges from 1.5 to 9.5 inches per second. The faster and deeper the water, the faster the sink rate required. Nippers and Forceps Nippers are an almost indispensable tool for fly fishers. But forceps that will also cut line (scissor clamps) are another handy tool. They trim line easily and can be used as a back-up for lost line nippers. Polarized Sunglasses Polarized sunglasses provide two essential benefits to fly fishers: they allow anglers to see through the glare on the water’s surface, and they protect the eyes from sharp hooks. Brownish colors — amber, bronze and copper — are the most popular lens colors because they enhance both contrast and color. Dry Fly Floatant Most dry flies require floatant to perform effectively over multiple presentations. Apply floatant before your flies get wet, and carry a desiccant powder for drying flies once they become water-logged. Best Release Practices You don’t usually need to handle a fish or take it out of the water in order to remove a hook or take a picture. Remove flies with forceps or a similar device, and use a net rather than your hands if you must control the fish. Remember, the larger the fish, the more damage you can do by lifting it out of the water. Leaf Bucket Stripping Basket You can make an inexpensive stripping basket for saltwater skiff fishing by putting a heavy wood or plastic bottom in a light-weight collapsible lawn and garden bucket. Wading Belts Always wear a wading belt with waders. Every year anglers drown in relatively shallow water when water fills their waders. Eye Protection Always wear eye protection. Carry a spare set of clear lenses to use when it is too dark to see with your regular polarized lenses. Crimping Barbs You can make a small hook “barbless” with by simply crimping the barb down with a pair of small pliers or a hemostat. The hook will penetrate better without the barb, and if you need to remove the hook from a portion of your anatomy, it comes out much easier. Undergarments for Breathable Waders Polypropylene long underwear makes the perfect undergarment for breathable waders: it’s light, very comfortable, wicks moisture well and dries quickly. Covering Up Covering up is a great alternative to sunscreen, especially in saltwater environments, where it’s easy to forget to reapply sunscreen 3 or 4 times a day. 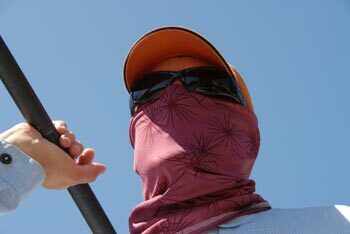 Lightweight facemasks — either tube- or balaclava-style — are a particularly good idea, since on hot day perspiration can carry sunscreen into your eyes. Ear Plugs Always carry ear plugs on overnight group trips.